I give you - fancy footsie frills. 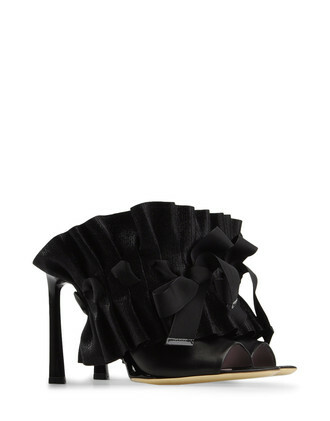 Viktor & Rolf ruffle. Feet candy. No, scrap that, eye candy. Yes this is friller, friller feet. How many more ruffles could one feasibly wish for? Not many, I declare with some conjecture. Am I right? No matter. Let's get back to basics. Speculate, if you will, why I have chosen to acquaint you, dear readers, with these majestic mules? Two reasons. 1) Rationalise with me again, if you will, as to whether or not they are worth the hefty price tag? 2) To introduce you to shoescribe, the genius asexual sibling of yoox.com. Not only do they offer an achingly exclusive conglomeration of foot candy but they proposition a service that goes above and beyond simple click and buy. I will leave you to peruse and discover at your own pace but please, please don't go and by them all. I'm saving up.